To those of us who doubt reality, actuality, and the thing-in-itself, and further, to those of us who are self-consciously embedded, implicated, contingent and contextual, not to mention confabulated, there is one inarguable and uncomfortable fact: Schrödinger's cat will die anyway. Sooner or later. Our observation of Schrödinger's putative cat may or may not foreclose that poor kitty's possibilities, but without a doubt that cat will die at some point. (fn 1) Death, and the inexorable end of all things, is an implacable truth for all relativists, modernists, postmodernists of whatever stripe, realists, speculative realists, and even critics and cats. I start with this assertion of death as a reality check and ground for the critique of postmodernism that is implicit in any consideration of the work of Robert Swain. For Swain's paintings are deeply and profoundly not postmodern. Or, if you will, post-postmodern, albeit avant le lettre. For the purposes of art theory, Schrödinger's cat lies (or slumps) along the same end of the continuum as: the Sapir-Whorf hypothesis,which supposes that the world is linguistically relative and semantically determined; Kantian and continental philosophy in general which treat all reality as the creation of mind or spirit (fn 2); and finally, postmodernism, identity politics and all schools of cultural criticism that assert that everything is relative, that there is no truth with a capital "T",and that we cannot know anything that is independent of our perception and experience. In a time of post-this and meta-that, Swain's abstract color paintings are seemingly impervious to ArtForum-ization, serenely hermetic in the midst of pastiche, pop culture and every conceivable pluralism. Consider a painting by Swain from 1977, Untitled (#7704). 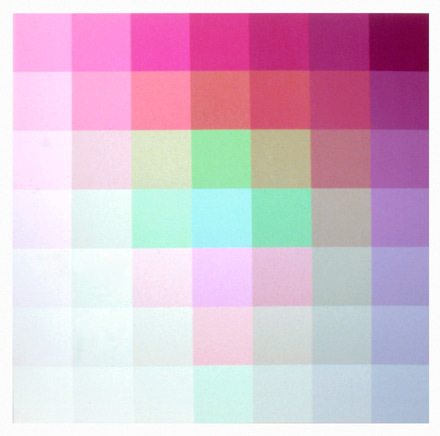 The square painting is itself made up of a grid of 9 x 9 squares, each painted a different solid color. Yellow, gray, and apricot color gradations work their way across the canvas in carefully calibrated steps to produce sweeps and flows of color saturation and light intensity. It's as if the sky at early dawn had been gridded off and rearranged, presenting an impossible view of the heavens in square segments. The painting is arrestingly lovely and the words that it inspires are considered unseemly in today's art discourse; nouns like truth and beauty, adjectives such as transcendental and timeless. Although participating in many of the symptoms of modernism, such as abandonment of illusionistic space and consciousness of its support, Untitled (#7704) would be an uneasy exemplar of the certainty and headlong teleological drive that was modernism. This painting is modest, a careful answer to a particular set of questions, one in a very long line of answers that have taken up the better part of the artist's 60 odd years. 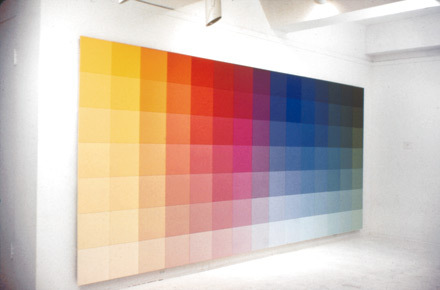 Swain restricts his artistic inquiries to those about color and color only--how do colors interact,what are the gradations of color, and what would be the optimal conditions under which a sustained investigation of color can occur. Given the tightly constrained parameters of his query, the paintings that comprise Swain's answers are unfashionably simple and beautiful in today's context, obdurate in their refusal of any postmodern reading and even resistant to contemporaneity. Swain's art lies somewhere between modernism's telic imperative and postmodernism's looting of the past--perhaps existing in an eternal present, or perpetually becoming, in the Benjaminian sense. (fn 3) Like Ad Reinhardt and Bridget Riley,whose work also superficially resembles modernism, but is yet resistant to easy categorization, Swain's work is a demonstration of Benjamin's concept of the ahistoricity of art. For Benjamin, art participates in an untimeliness that is both part of and also outside of its present. Art references the past, to reach toward the future, and is ever just “passing through” the present, forever unfolding and becoming. Modernism's demise has already been rehearsed exhaustively, but postmodernism in all its incarnations is the accepted background against which art today is to be seen and analyzed. I would like to suggest that Swain's paintings are a refreshing corrective to the buzz and fuss and recursive hall of mirrors that is postmodernism. In quiet negation, the paintings take a position opposite from that of louche slacker art, knowing appropriation, boundary-crossing globalism, ironic self-referentiality, identity politics-driven critiques of the status quo, new media discovery and even craft-dismissive conceptualism. To counter postmodern relativists' insistence that nothing is except as we perceive it, and that we each perceive differently as we are all differently enculturated, speculative realism offers an alternate prism through which to view art and, in particular, Swain's paintings. As espoused in the last several years by the likes of Alain Badiou, Ray Brassier, and Quentin Meillassoux, speculative realism is opposed to what they term correlationism,which includes postmodernism and that continuum, mentioned above, along which sprawls Schrodinger's cat, as well as any cultural criticism that presupposes that we cannot think of a world independent of us. Speculative realists assert that of course there is a reality that exists outside and independent of human thought and that we can indeed speak of it. (fn 4) Their ultimate proof of an independently existing reality is, of course, death, the example of which I shamelessly stole from Brassier. (fn 5) Death exists, whether or not we can perceive it, speak it or conceptualize it. Hence, that cat will die. Moreover, speculative realists use math and science, including neuroscience, to further their contention that "[w]e must accept that we are embodied beings living in a fundamentally inhuman world – one that is indifferent both to our conceptualizations and to our needs." (fn 6) In Ray Brassier's formulation of the scientific argument for reality, intellectual honesty would insist that if we acknowledge the truth of scientific statements such as ‘Man is a carbon-based information processing system’ (fn 7), then we must also acknowledge the truth that we humans are not outside the reality described by science,that we do not, in fact, have a basis for the anthropomorphization of the world. (fn 8) Rather than addressing the larger question of an inhuman world, I would like to focus on the smaller issue of human perception, and its purported lack of universality, a subset of speculative realism's critique of postmodernism. In the version I am using here, I return to the correlationist insistence on human perception, but I unhinge it from thought, basing my arguments instead on the neurophysiological bases of perception. By taking the focus off of ideation and cognition, and re-placing it on the messy and non-rarified terrain of the biological, I am in sympathy with the speculative realists' insistence on a real world,with which we interface through embodied selves. Swain's paintings come into play at the juncture of speculative realism, neuroscience, and recent research on the human perception of color, research which is incompatible with many of the tenets of postmodernism. Swain's paintings are about color only, and every development in his painting is in pursuit of a fuller access to color, one that is minimally mediated. 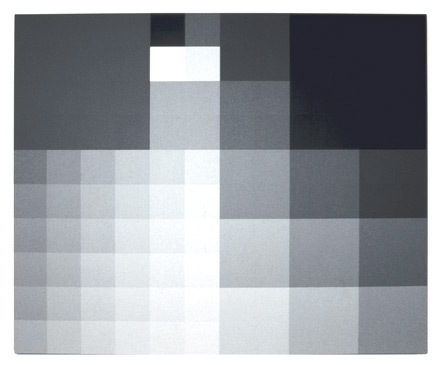 From early on, as seen in works from the 60's such as Untitled (#6801) and Untitled Triangle (#6804), Swain strips down his format to lay, as bare as possible, the simple assertion of color. In each, he employs a formula that will hardly vary over time: simple modules repeated in different solid colors, with the interior components referencing the shape of the overall composition. In one of his earliest canvasses, Untitled (#6702), already he has eliminated narrative, figuration, impasto, and anything but the starkest of excuses for composition. The composition serves as the least intrusive framework to hold colors which, in contrast,dissent and harmonize, syncopate and flux, the blues, oranges, greens and reds restlessly shifting in place. In a move to be repeated throughout his career, Swain also places the lightest colors at the bottom, thus defeating any attempted landscape reading of the rectangular composition. 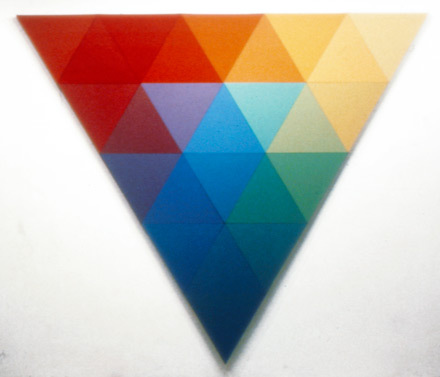 He works through triangular, hexagonal and circular formats to best get at as pure an experience of color as possible, settling in the 70s on the square and rectangular canvases on which Swain will forthwith conduct his long study of color. Within his spartan parameters, Swain paints canvasses that we, inevitably as human beholders, will interpret as, for instance, veering from muscular to translucent, Untitled (#6701) and Untitled (#7903), from forboding to whimsical (#9601) and (#8102), allowing us to see all the possible narratives inherent in color alone. But whatever our projections of "rising", "falling" "transcendent", "stoic", or any other kind of movement or stories we make up for what is happening on the canvas, Swain's colors have their own non-freighted narratives--of perceptual steps in color, of spectral miscegenation, of, for instance, absorbing 70% of a certain spectrum of light or,contrariwise, of reflecting it. These paintings are not spiritual in the Kandinsky or any other sense, and neither are they "expressive" in terms of a one-to-one correspondence with an emotion or a phenomenon—for instance, there is no correlation here between the color blue and heightened spirituality. 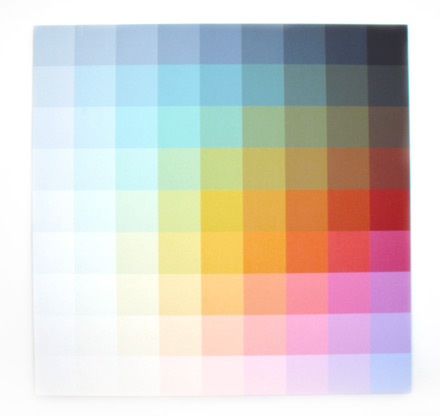 Rather than some cultish or new agey theology of colors based on symbolism and spirituality, Swain instead painstakingly constructed his color system from empirical observation of colors and their interactions. (fn 9) Swain painted dozens of charts, hundreds of samples, "to orchestrate interval relationships between hue, values and saturation... to compared and adjusted color relationships, in an effort to establish continuity and consistency." (fn 10) With his system, Swain has isolated thousands of colors and carefully charted out their relationships to each other, to provide the building blocks for the grids wherein he explores the myriad ways that color can be received and perceived. This, as speculative realists would say, is the real biting back at the hubristic notion that we make our worlds. Contra continental thought and postmodern presupposition, language does not, after all, shape our perception of color. Imbedded in biology, though not in color itself, there are prior perceptual categories. Even though human color structuring is not deducible from the physical properties of light alone, the neural states responsible for the perception of red, green, etc., are dependent upon these physical properties. It should be noted that these studies seem to fold phenomenology into physiology, but the postmodern presumption of contingency is still refuted if we interpret these results as establishing a universal link between perceptual, as opposed to absolute, categories and semantics. I am not here assailing the larger correlationist tenet that we cannot know anything that is independent of our perception qua human beings. I am just challenging the presumption that humans as a whole could not possibly have anything in common on the perceptual level because, of course, this specific argument is based on the universality of human perception, not the universality of color in areas outside of human perception. There's an interesting contrast here between the painstaking means by which he arrived at his color system, the terse parameters he sets himself, and within those restrictions,the intuitive process by which he actually composes his paintings (fn 15) and the rich, often lush results. 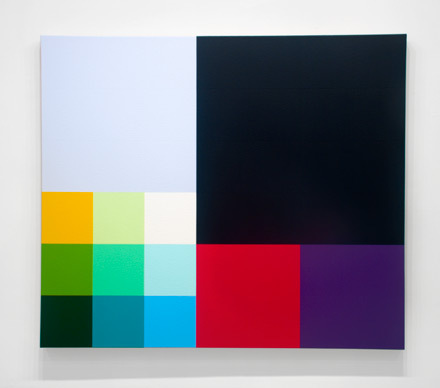 By presenting color in compositions that are minimally compositional,while allowing the maximum interaction of color, Swain sets out the most favorable conditions for a non-contextual, de-historicized experience of color, to the extent that any such experience is possible. 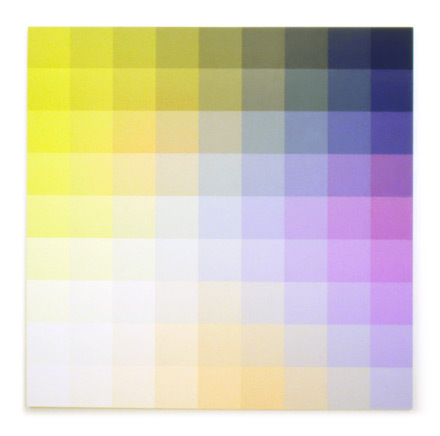 In Untitled (#9001) from 1990, a grid-based canvas contains 13 colors, but the boundaries between the squares create another 22 colors that emerge as they are mixed in the eye. At the center of its square, each color--black, red, orange, lavender, etc.--is perceived as itself, more or less unadulterated. 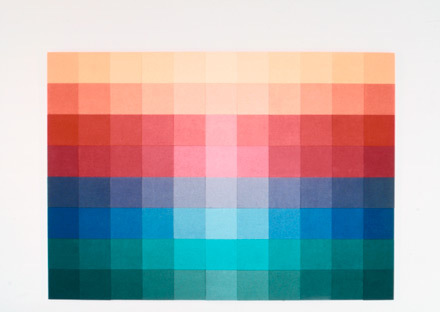 At the edges of each square, the adjoining colors creates new, other, sensations of color. At the border of red and black, for example, the red is a more intense red, while the black is a deeper black. That same red, when confronted with the pane of light blue, takes on an orange cast. This is a subtle and slow art, yielding the most when appreciated over time so as to allow the colors to "fix" and then differentiate themselves in the eye and mind. Swain's paintings also produce a surplus effect, a more-ness. This more-ness is tied to the very simplicity of his means, namely, the grid. The grid runs through almost all of Swain's paintings since the late 60's, seen most directly in the square paintings, but also serving as the organizing principle for the rectangular golden mean works and the most recent "biomorphic" canvases. In Untitled [11-25-7 x 23-25-6 x 27-25-6], the grid is implied but can clearly be discerned in the demarcations between the different sizes of flowing shapes. The grid itself seems to be globally recognized, having been found in cultures as diverse as those of ancient Egypt, Benin, Mesopotamia, Inca and China, although the grid has particular artistic resonances for those of us who grew up with the western tradition of perspectival space. There's no need to rehearse the well-worn territory of the grid, (fn 16) except to point out that the format of the grid is both constraining and excessive--limiting the possibilities of form but inviting unlimited proliferation of that form. 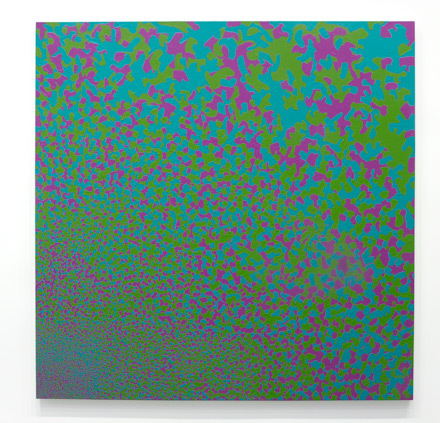 Swain's seriality is an intimation of infinity, that the existing paintings are a vanishingly small subset or manifestation of literally endless permutations of color. His work uses the sameness of form, of single-colored modules of the same size and shape, to wring abundance out of formal poverty. Of course, in this day, colored grids must bring to mind colored pixels on monitors, and the technologies of digitization, which also promise infinitude. But that subject could fill another essay or two entirely by itself. Despite Swain's use of the grid and other means to strip away anything other than pure color, there may be no way to have a completely unacculturated viewing experience, as we are all, each of us, en-cultured, imbedded, entangled and implicated. But we are not just culturally encoded or post-colonially inscribed or what-have-you, we are also inhabitants of bodies with their own physiological and neurological imperatives and processes, at least some of which are not culturally determined. As recent research shows, the neurobiological ground upon which this viewing experience happens, the actual synapses, rods and cones involved, does share in some kind of cross-cultural fidelity: all human cultures see the same or similar colors and have similar categories for these colors. Swain, by doing away as much as possible with any and all cultural markers, tries to get at the neurophysiological bare bones of color perception to produce a minimally relativistic experience of art. His art attempts to show that color, freed from distractions, is by itself a thing. And that these things react, mingle, exchange, which of course is interpreted by us with our deeply implicated perceptions. Conversely, there may be no way to fashion cultural production that is "real", some kind of art reality divorced from human perception. I'm not sure what a truly speculatively real art would look like anyway, or whether it would be interesting. Surely such an art would do without narrative and figuration. Perhaps, for instance, it could rely on mathematically derived intervals in its composition of rigorously measured spectral light emissions? But complete hermeticism is a refusal to acknowledge everything and anything outside itself:time, context, audience, and, in fact, a refusal to countenance any kind of discursive space. science fiction writers and cultural theorists. Pure Reason, trans. Werner S. Pluhar (Indianapolis: Hackett, 1996). proposes that art "exceeds itself" and is never only present, as it is ever in the process of becoming. Walter Benjamin, The Origins of German Tragic Drama, transl. John Osborne (London: Verso, 1977). Ontario’s Centre for the Study of Theory and Criticism, November 2008.
socialized, much less for cultural theorists. 10. Robert Swain, personal email, May 26, 2009. Modern Art, 2008), p. 17. Readings on Color, edited by Alex Byrne and David R. Hilbert (Cambridge: The MIT Press, 1997), p. 400. Note that Kay and McDaniel explicitly refute the Sapir Whorf hypothesis, p. 400. (Cambridge, MA: MIT Press, 1991). fervently in the possibility of re-“making” themselves.